A Cuban-style Rum from the Dominican Republic aged using the Solera method. Oliver Juanillo came to Cuba in 1868 as a young Spanish soldier defending Spain’s claim on the territory. When his military service concluded, he founded a plantation farming tobacco and sugarcane. Within twenty years he was distilling Rum using the cane he grew — passing his plantation and Oliver and Oliver distillery on to his children. Then, in 1963 the Cuban Communist Revolution forced the family to flee — but they didn’t go far. The next island over was the Dominican Republic, and the family set up shop once again on these friendly shores where they distill some of the finest Dominican Rums to this very day under nineteen different brands. Oliver and Oliver Rums are distilled from pure care juice — which isn’t common in a Cuban-style Rum. 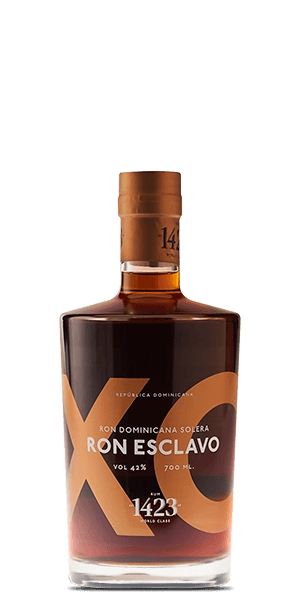 Ron Esclavo XO Rum earns its “XO” designation by being aged in ex-Bourbon casks using the Solera method which — as you may remember — is where not all of the old Rum is emptied from the cask before the new Rum is added over time. That means some of the Rum in this bottle is quite old indeed, even though there is no age statement. It’s a great way to build up consistency and complexity at the same time, and this Rum has plenty of both. What does Ron Esclavo XO Rum taste like? The Flavor Spiral™ shows the most common flavors that you'll taste in Ron Esclavo XO Rum and gives you a chance to have a taste of it before actually tasting it. The aroma is rich and sweet with notes of honey, caramel, and ripe banana. The flavor profile is complex and delicate, yielding notes of butterscotch, vanilla, cinnamon, and mint. The finish is light and long with a warm afterglow.